Home › Ask the Vet › Electrolytes and Ulcers: Is There a Link? Electrolytes and Ulcers: Is There a Link? I’ve heard lately that electrolytes are contraindicated for horses with a history of ulcers – is this true? My OTTB mare was diagnosed and treated successfully for her ulcers with the appropriate course of GastroGard last year but I have been giving her daily electrolytes since I bought her, not knowing they could be doing damage. Should I not give her electrolytes and if so, what should I be providing for her? She is ridden 6 days a week and sweats a good amount. Good job on getting your mare diagnosed and treated for gastric ulcers! Now ensure they don’t return by focusing on lots of forage, lots of turnout time, lots of social interaction and limited grain, stress and non-steroidal anti-inflammatory drugs (NSAIDS). Also consider providing a daily supplement clinically proven to maintain stomach health. Holbrook TC, Simmons RD, Payton ME, MacAllister CG. Effect of repeated oral administration of hypertonic electrolyte solution on equine gastric mucosa. Equine Vet J. 2005 Nov:37(6):501-504. The researchers know that endurance horses have a high incidence of gastric ulcers, and that endurance horses receive electrolyte paste frequently throughout competition so they designed a specific study to test whether the two are related. Fourteen horses were divided randomly into equal groups and administered either 60ml water (placebo) or 56.7 grams of a commercial electrolyte supplement mixed with 60ml water by dose syringe orally once an hour for 8 hours. Gastric lesions were scored before and after oral treatments. They found a significant increase in ulcer number and severity, and concluded that this particular schedule of electrolyte supplementation (used commonly in endurance horses) may be harmful to the gastric mucosa. Now, you’re not giving electrolytes anywhere NEAR the amount or frequency that the researchers did in this study. And I am unaware of any study that shows once daily administration of electrolytes in the feed has any impact on the stomach lining. 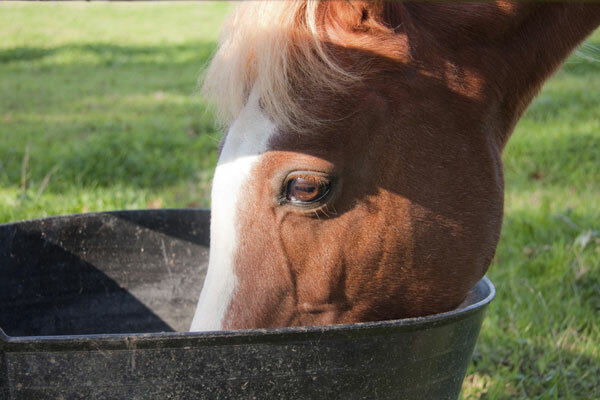 In my opinion, it’s much healthier to replenish the minerals your mare is losing in sweat and to stimulate her to drink to also replace the water she has lost. Sounds to me like you’re doing the right thing—keep it up! My vet today on scoping a horse with grade 4 gatric ulcers explained that electrolytes, being salty, may irritate ulcers, especialy where the ulcers have formed “tiger stripes” along which the saliva laden with electrolyte salts will run. The pain from this can reduce a horse’s appetite resulting in less buffering of the acid which causes ulcers.